These days it seems like every other movie released is in 3D, but back in 1953 it was still a rarity. That was the year that HOUSE OF WAX was released to theaters. It was the first major studio film in color to be shot in 3D, and as an added bonus the sound was in stereo. And the funny thing is, director Andre De Toth was blind in one eye, and therefore couldn't see things in 3D. Then again, maybe that's part of why HOUSE OF WAX still holds up fairly well. Instead of focusing on his film's gimmick, De Toth concentrated on telling a good horror tale. The plot of the film is the stuff of lurid pulp horror all the way. Professor Henry Jarrod (Price) is a sculptor of wax figures with considerable skill. Much to the chagrin of his business partner Burke (Roy Roberts), however, he refuses to put a chamber of horrors in his wax museum. Jarrod would much rather capture beauty, perhaps best exemplified by his figure of Marie Antoinette. Looking to make a quick buck, Burke decides to torch the place for the insurance money. Jarrod tries to stop him and winds up dying in the conflagration. Or so it seems. As it turns out, Jarrod has survived and is about to open a new wax museum. His injuries have left him confined to a wheelchair, and his horribly scarred hands are no longer capable of sculpting, a task now left to his assistants. Perhaps seeing himself now as something of a living horror, Jarrod now embraces the chamber of horrors mentality fully, even going so far as to feature a special section of his museum that will focus on the most sensational recent crimes. While Jarrod is busy readying his museum for opening, a mysterious cloaked figure with a terrifying visage embarks on a murder spree, the first victim of which is Jarrod's old partner Burke. Burke's fiancée (Carolyn Jones) is also murdered, and her friend Sue Allen (Phyllis Kirk) is disturbed when she sees how much Jarrod's figure of Joan of Arc looks like the deceased girl. Of course it could all just be a coincidence, right? This being 1953, the film is quite tame in terms of gore and explicit sexuality, but it nonetheless implies a good deal in the way of sordid goings-on. Price is perfect in the role that would transform him from a jobbing character actor into a horror star, still young enough here to show a little more physicality than in his more iconic later roles, and displaying less of his trademark hamminess as well. Not that there's anything wrong with Price hamming it up in my book, but it's always a bit of a revelation to catch him in one of the roles where he shows more restraint, and to realize that this guy really was a good and versatile actor. I can't speak to the 3D personally as I've only ever seen the movie in its flat version. That said, there are a number of moments that are extremely obvious in their intent to have something jump off the screen at the viewer, and it's hard not to think of the old SCTV skits with John Candy as Dr. Tong shoving objects at the audience, e.g. “Would you like some... syrup?” (wee-oop, wee-oop) from '3D House of Pancakes'. The most obvious of these gags in HOUSE OF WAX is the barker outside of Jarrod's museum doing tricks with paddle balls. As corny as these bits of business are, they kind of add to the overall fun of the affair. But as mentioned earlier, the 3D is really just an aside, an afterthought almost. The main purpose of the film is to provide thrills and chills for its audience, and while there's no denying the film feels a bit dated at times, it still manages to do just that. 3 out of 4 stars. I heard (cannot confirm first-hand) that to see Vincent Price give a really good lead dramatic performance, outside of the horror/thriller genre, a prime specimen is Sam Fuller's 1951 fact-based western THE BARON OF ARIZONA, about a frontier con artist. Maybe high time the Cinematheque did another Sam Fuller retrospective? I can speak a little bit on the 3D in HOUSE OF WAX. Apparently, the master negative of this film was a mess, and WB went to great lengths to restore it. 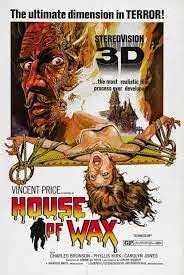 I have a 3D tv at the house, and while it is never as good looking as 3D (done right) in the theater, the 3D in HOUSE OF WAX floored me! If it looks this good on the television, it's going to be insane on the big screen! They actually just showed 'Baron' on Turner Classic Movies but I stupidly didn't set the DVR. Might show up there again, though. And at least for a great supporting role in a non-horror film there's LAURA, one of the finest film noirs ever.